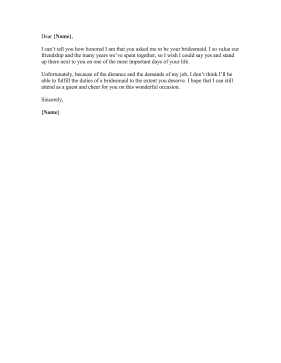 Bridesmaids and groomsmen can use this printable wedding party rejection letter to step down from their roles. I can't tell you how honored I am that you asked me to be your bridesmaid. I so value our friendship and the many years we've spent together, so I wish I could say yes and stand up there next to you on one of the most important days of your life. Unfortunately, because of the distance and the demands of my job, I don't think I'll be able to fulfill the duties of a bridesmaid to the extent you deserve. I hope that I can still attend as a guest and cheer for you on this wonderful occasion.